Intense competition among insurers, downward price pressure and an abundance of companies to choose from, have given customers high motivation and low friction for switching providers. In fact, switching insurance carriers’ accounts for nearly $6 billion* in business per year in the U.S. alone. For a customer who files a claim, the likelihood of switching to another insurance carrier nearly doubles. The bottom line is that insurance companies are scrambling to cut costs while improving service, with an eye toward the crucial goal of customer retention. Claims processing and first notice of loss (FNOL) are logical candidates for automation, as they have been labor-intensive, time-consuming functions and are the single largest expense for the insurer and result in longer delays for the customer. Accurate crash detection, then, would provide the tools to trim a major cost center while providing a faster, better customer experience. The key here is accuracy: if crash detection is reliable, it helps with customer retention; if not, it can have a negative effect on customer retention. To understand why, let’s take a look at how accidents affect the customer. For an insurer or fleet manager, managing a large pool of vehicles, accidents are high-frequency (they happen often) but low-consequence (any given crash may not be significantly detrimental to the aggregate group.). A system with a measurable error rate is important yet not a priority for someone managing risk and cost for an insurance pool or a large fleet. From the point of view of an individual driver, however, a crash is a low-frequency but very high-consequence event. Consumers who are involved in crashes have a very low tolerance for inaccuracy, especially false positives. A vehicle risk management system that interprets speed bumps and door slams as collisions would erode consumer confidence, and might cause high levels of constant stress—definitely not a positive customer experience. For example, an airbag that deployed when the car bumped the curb would be entirely unacceptable. A system that did not detect a crash would be a disaster: imagine an airbag failing to deploy when needed! For a driver, a crash is a rare event that must be handled precisely, and the slightest inaccuracy in crash detection can have life threatening implications and ultimately make the difference between customer retention and a high churn rate. For crash detection to act as an effective customer retention tool while lowering costs, it must have a very high ability to distinguish crash events (the signal) from non-crash events (the noise). For our technical readers, this requires multiple self-calibrating accelerometers with sufficient dynamic range—the ability to measure very small events and very large events—and a reliable algorithm to interpret and classify the events. Multi axes sensors can independently measure forces in the direction of travel, side-to-side, and vertically to provide a complete picture of an event. 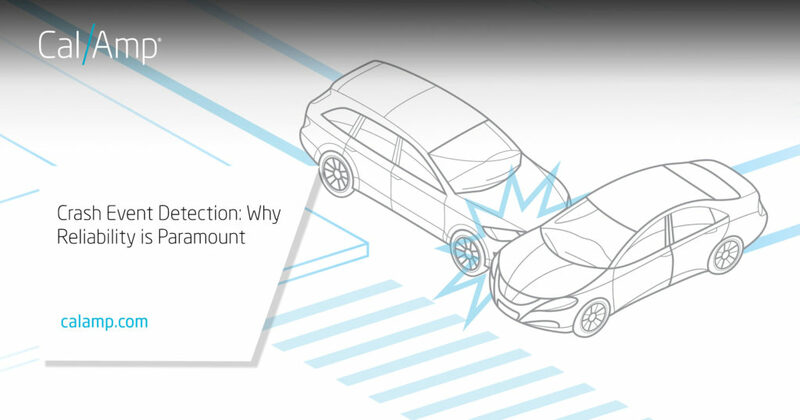 A crash detection algorithm must be as accurate as an airbag deployment system, firing unerringly during a crash and never at any other time. It is clear, due to the pressure to improve service while cutting costs, automated crash detection and FNOL are here to stay, and that’s a good thing. Lower costs for insurers, along with faster claims processing and better service for customers, are a net benefit for all parties involved. The ability to estimate vehicle damage and reconstruct the accident in near real time after a crash, means the process of recovery begins sooner for the driver and helps keep claims efficiency high for the insurer. Systems that are built on reliable crash detection can also reduce fraud by making it very difficult to file a false accident claim and make it possible to perform immediate remote vehicle triage to determine whether the vehicle should be towed to a repair facility or treated as a total loss. It all depends on the reliability of the algorithm. CalAmp’s CrashBoxx vehicle risk management system was developed by OEM vehicle and safety system veterans, tested by 3rd party testing agencies under controlled laboratory conditions, and provided by a pioneer in telematics. For more information about crash detection, check out Automating FNOL And Claims For Property And Casualty Insurers..